Raquel Fox grew up in The Bahamas where she learned to love the nuances of traditional island cooking from her grandmother. Always a seeker for knowledge, she attended international schools where she catalogued authentic family recipes from a melting pot of friends from all over the globe. 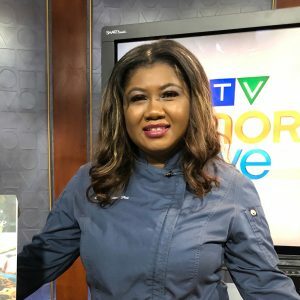 Her passion for food and travel soon led to the establishment of Raquel and her husband’s restaurant, The Wine Lounge, which USA Today voted as one of the 10 Best Bahamian Lounges. Raquel had a wider vision, and the family moved to Canada where she attended The Chef School at George Brown College in Toronto, where she explored all aspects of cooking, food culture and international cuisine. She now teaches her own Caribbean Cooking Course at the college, in addition to attending several events as a motivational speaker.